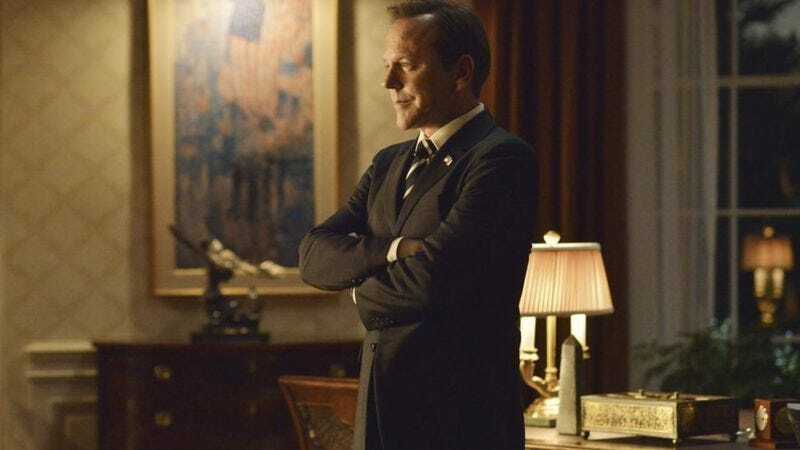 The most obvious way to describe Designated Survivor—a mash-up of The West Wing’s idealism and fascination with the compromises of our political system, and 24’s intense, convoluted action plots—is also the best. Putting Sutherland in the lead role gives the game a way a bit, but one of the things that’s keeping the show together, even as it fumbles through less than compelling domestic drama, is seeing where those two forms complement each other, and watching how the show works to find the ideal balance between the challenges of running a government and pulpy conspiracy thriller theatrics. The two don’t always blend well, but when they do, the energy from one can bleed into the other, encouraging us to root even harder for Kirkman and his team’s efforts to rebuild even as some shadowy force works to undercut them at every term. But first… there’s Leo. I almost feel bad for mentioning it, but since “The Results” devotes several minutes to Paternitygate, it’s necessary to point out once again how fundamentally uninteresting this plotline has been. It’s sincere, and there’s a certain symbolic resonance in questions of authority and identity buried under all the melodrama, but in the face of a national election threatened by terrorism, and Hannah’s efforts to track down the group responsible for this whole mess, scenes of Leo staring stone-faced as someone tries to appeal to his basic humanity fall inevitably flat. Tonight seemed almost to agree, as, barring any future twists, the matter was taken care of about as definitively as possible. Leo proves his love for his dad by refusing to open the paternity test results; Kirkman opens them privately, finds out he’s the biological dad; and the president shows Lisa the proof, thus ending the investigation more or less permanently. The fact that Kirkman’s DNA matches Leo’s is a dramatic cop-out, but if it means the thread is tied off, I’m all for it. Especially when the rest of the hour is as solid as this one. The election threat is a great plot hook, setting up a seemingly impossible situation and forcing Kirkman to act definitively in the face of an amorphous and potentially devastating threat. The crisis—an anti-government militia member covers polling machines with ricin—isn’t tied into the main threat (so far as we know), but it’s a good example of the kind of Governmental Ethics 101 word problem that Kirkman and his staff should be facing regularly. Sure, it’s a little too clearly designed to work as any serious examination of the president’s responsibilities in the face of a domestic threat against democracy, and the resolution is too pat by half: Kirkman, after watching an impassioned speech from the daughter of a woman killed by the ricin attack, decides to go ahead with the election; his decision to vote himself eventually inspires others to do the same, although we’re only told “there are lines at the polls” and not actual numbers. But that’s fine, because this isn’t a serious drama. What works here (and it’s what makes the Leo stuff almost seem necessary) is the feeling of constant pressure, and the catharsis of seeing a noble hero respond to that pressure by taking a risk and being rewarded for it. That’s a simple model, and I’m not sure I want too many more episodes where Kirkman’s mind is changed by some last minute play on his emotions, but it’s still pretty fun to watch. The immediate resolution of Jason’s storyline is also good, if somewhat goofily designed. Building up to a potential threat on Kirkman (including lots of fun, creepy camera angles), only to spin around to Jason confessing to the murder of Nassar manages to escalate the threat, taking one more good guy off the field, without making any massive changes. Again, this is pretty basic stuff, but it keeps Hannah on her toes while still keeping Kirkman out of the loop in a way that doesn’t seem like a cheat. Hannah doesn’t accomplish a whole lot, once again finding information too late to actually be able to do anything about it, but “The Results” does introduce a staple of the genre in Chuck, the funny, self-deprecating tech nerd. I don’t think there’s a single character on the show who doesn’t fit neatly (a little too neatly, really) into a pre-existing archetype, but at least Chuck had a line that made me actually laugh, which was a nice change of pace. Designated Survivor leans pretty hard into its earnest depiction of good men and women trying to protect America and the bad people who get in their way, and that kind of total unselfconsciousness can’t afford too many jokes at its own expense. But occasional wit would help make some of the more familiar elements a lot more appealing. Apart from that, well, Hookstraten is getting suspicious of MacLeish, although she assumes his support of the president is pure political opportunism. For his part, while MacLeish does meet with the woman who kidnapped Jason’s son and gave him his marching orders, the Vice President-to-be has some apparent reservations about all the murder going around. There’s some question as to whether or not he’s working with the bad guys under duress, although if I had to guess, I’d say it’s one of those “I believe in the cause! Wait, you’re all monsters?” idiots who ends up nobly sacrificing himself down the line when he realizes his whole life is a lie. Maybe we’ll find out next week. Why does the kidnapper give Jason typewritten instructions? I mean, yes, the obvious reason she does it is to maintain suspense as to just what he’s going to do when he meets with Kirkman, but I’m hard-pressed to think of an in-story reason. Was she worried she’d forget the name of the poison? Nassar gets a proper Muslim funeral. This may be the show’s most idealistic moment to date: giving a hated enemy the honor of his own faith’s last rites. Jason tries tip Hannah off as to why he’s working with the bad guys, but apart from letting her know he isn’t actually evil, I’m not sure it accomplishes much. So, the ricin was spread by a guy named Walter. That hasn’t to be a reference, right? Hey, don’t the Kirkmans have another kid?